Your favorite treat, made in you own kitchen! Add 1 cup of flour, cinnamon, nutmeg, and eggs to the milk mixture and beat until combined. In a small frying pan, melt butter over medium heat. Add apples, lemon juice, sugar, and spices and cook while stirring frequently, until apples are soft- about 4 minutes. Remove from heat and stir in flour. Bring mixture to room temperature. On a lightly floured surface, roll the dough out to a 1/2-inch thickness. Spread the apple mixture onto half of the dough, then fold the other half over the apples. Cut 2 inch wide strips. 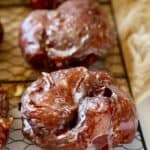 With floured hands smash the dough and apple together and tuck in any apples that stray, and press each fritter into a flat round. Coat 2 rimmed baking sheets with flour. Transfer the uncooked apple fritters to the baking sheets. Whisk together powdered sugar, vanilla, and maple syrup in a large bowl. Start with 1 tablespoon warm, and add more if needed. Whisk until glaze is smooth and the consistency of a semi thick glaze. Fill a large, heavy-bottomed pot with at least 2 inches of vegetable oil. Heat over medium-high heat until a deep-frying thermometer registers 350°F. Using a spatula, carefully and gently lower 1 fritter into the oil. Fry dough for 1 to 2 minutes per side, turning a few times, until the fritters are light golden brown and cooked through. Remove with a slotted spoon, drain on a wire rack over a paper towel, and let cool for one minute before glazing. Dip the top of the warm fritter into glaze, letting the excess drain back into bowl. Place on wire rack to dry. Continue with remaining dough making sure that between batches, the oil temperature returns to 350°F and any floating pieces of dough or apples are removed. Enjoy the same day or freeze in an airtight container, layered with wax paper between fritters for up to 30 days. Defrost and microwave 30 seconds before enjoying.